From The Christmas Carol to The Tale of Two Cities and Oliver Twist, the Anglo-American social conscience has been challenged by the prolific 19th century journalist Charles Dickens. While Dickens’ social morality is immediately evidence, Gary Colledge also argues that Dickens wrote out of the centre of a deeply Christian worldview. 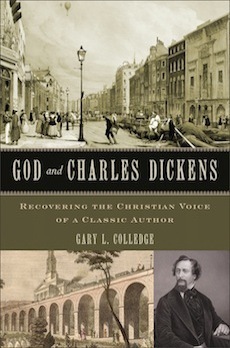 Often missed in scholarship and overlooked in Dickens’ own anti-ecclesiastical writings, Colledge aims to restore the Christian voice of Dickens for both appreciative readers and critical scholars in this reworking of his PhD dissertation. After a helpful introduction and first chapter laying out the project and Dickens’ Christian perspective, God and Charles Dickens falls into five topical chapters. Each of these treatments covers an aspect of Dickens’ Christian belief and peculiar social critique. In Colledge’s presentation, we see a Dickens that is essentially Jesus-centred, relying upon the New Testament, and working his faith out in love and tangible “goodness” in the world. While Dickens may look like he has some unorthodox critiques of theology and church, Colledge argues that they largely fall in line with nineteenth century popular lay Anglicanism. 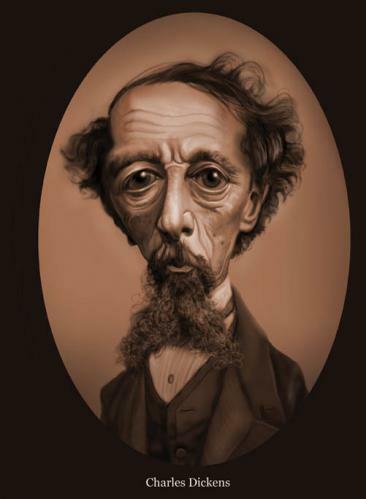 Dickens certainly understood the depravity of humanity—his tales tell that dark story most evidently—and he had hope for humanity when he was at his most optimistic. Weaving together Dickens’ letters, essays, sermons, and novels, we see that Dickens’ God is providential creator and Jesus is the deliverer of humanity. Dickens launches satirical and open challenges to many aspects of his religious world not because he rejected faith but because he desperately wanted what he called “real Christianity.” His critique of dissenters and Evangelicals comes out of a cultural dislike of the problematic Christianity he saw played out in the pulpits and streets of England, rather than a sophisticated theological critique. Intentionally, this book is a restrained guide where Colledge chooses to get out of the way and allow Dickens to speak. In this project, he is following Dickens’ own advice to Christian preachers who so often draw people to themselves instead of Christ. It is probably a relevant critique for today—a relevance the author capitalizes upon as each chapter ends with a note to the church. I do not think that Colledge falls into this trap, however. He allows the ambiguity of Dickens’ beliefs to hang in the air, and occasionally critiques them. While I think a fuller treatment of Dickens’ marriage breakup and his early flirtation with Unitarianism are warranted, Colledge doesn’t run from other difficult moments. For example, due to his disgust with a popular rigid Calvinism, Dickens seemingly rejects substitutionary atonement through the vicarious suffering of Christ. Colledge sets this particular departure from Anglicanism in context, but allows it to sit in all its complexity. In his reading, I’m not sure that Colledge saw the lack of the cross in Dickens’ thought—a lack of a Cruci-centric vision that stands in strange contrast to his Christo-centric spirituality. However, I think Colledge drew out Dickens’ genuine faith and demonstrates superbly the Christian influence throughout all of Dickens work. In short, Charles Dickens’ novels are soaked through with the Christian worldview, and work to call people back to a heartfelt, Jesus-centred, New Testament-based faith. The result is a helpful, accessible book that comes out of Dr. Colledge’s larger academic project to challenge mainstream thinking in Dickens study, and at the same time augments our resources on Christianity and literature. This review appeared in Haddington House Journal in 2013. God and Charles Dickens: Rediscovering the Christian Voice of a Classic Author. Gary Colledge. Grand Rapids: BrazosPress, 2012. ISBN 978-1-58743-320-7. Given my current foray into all things MacDonald, I’m especially intrigued with these statements- ‘While I think a fuller treatment … and his early flirtation with Unitarianism are warranted, Colledge doesn’t run from other difficult moments.’, and ‘For example, due to his disgust with a popular rigid Calvinism, Dickens seemingly rejects substitutionary atonement through the vicarious suffering of Christ. Colledge sets this particular departure from Anglicanism in context, but allows it to sit in all its complexity.’ I’ll have to put this on my wish list Brenton. Have you read G K Chesterton’s, ‘Charles Dickens, The Last of the Great Men’? I have not read that, though I read something… was it a chapter in Heretics? No, I’m not sure. Anyway, I love Chesterton, even when I’m not sure I understand him. This review was for a Reformed journal, so I noted the Reformed-type issues. It was a pretty good read, speaking as someone who is not a Dickens scholar. No, it was a 1942 edition of a fairly lengthy piece by the old chap. Ahh ha yes, I love him too though barely fathom him at times. I can same the same Brenton, so I feel in good company ; ) . Ever read The Flying Inn or The Man Who Was Thursday ? Oye . His bio of St Francis however was delightfully heady, wonderful, and digestible. Actually, the St.F bio is on my list… an evergrowing list, I’m afraid. I have these lists of books on my wall, and they are getting checked off very slowly! I read “Charles Dickens: A Life by Claire Tomalin” last year which I found very readable and informative and I have just finished Little Dorritt which has many examples of his perspective on God. Truly he had a very canny insight into human nature and his stories are amazing. I recently read that next to the Bible and Shakespeare, Dickens had the biggest influence on the English language, I don’t know how true that is. It’s hard to know how we could measure “influence,” but you may be correct. Leaving out religious influences like John Wesley, it probably isn’t far from the mark. Interesting! I’m not sure I would entirely agree with your statement about Metaxas’ book, but I do get what you are saying there. But back to Dickens, I guess I never really thought that he was anything but Christian, so it kind of surprised me that this book would even be necessary. Shows how much I didn’t know about Dickens, I suppose! I sort of hedged my bets on Mataxas, simply because I don’t know enough of about Bonhoeffer to be super critical. It is an American reading of Bonhoeffer, which I don’t think should be considered a bad thing in and of itself. As a non-American, I get uncomfortable with some of the American portraits of C.S. Lewis, so I was using that analogy. Someone more researched in Dickens could pipe in here and say whether Colledge is truly in danger here. I learned knew things, for sure (as I do with Mataxas and American treatments of Lewis). Yes, I see your point. It is true that we all see things from our own cultural perspectives, which shouldn’t necessarily be considered the way things “really” are. All these different perspectives are valuable, though, in building a picture of the whole thing. Like the blind men and the elephant, I suppose. I’ve read Chesterton’s History of England, but not Dickens’ version–or the Life of Christ passages, though both are discussed in this book. Is the History anti-Christian or colonial or royal…?